Hurricane Sandy is the largest Atlantic hurricane on record in terms of diameter of the storm. Sandy was associated with an estimated 13 foot storm surge in areas near New York City. The Wikipedia has a good discussion of the meteorology, preparations, and impacts of Sandy. Sandy was a highly predictable storm. Allow me some bragging rights regarding the forecasts made by my company CFAN (see this post describing our forecast methods). We began watching the potential for disturbance in the Caribbean on 10/12, and on 10/16 we forecast a 40% of forming a TC and on 10/19 we predicted a high probability of formation. On 10/23, the NHC named Sandy as a tropical storm. CFAN’s forecast on 10/23 predicted a high probability of Sandy becoming a hurricane, with a 30% probability of landfall on the U.S. northeast coast. On 10/24, we predicted 50% probability of a landfall on the northeast U.S. coast on 10/29 or 10/30, with the most likely location between Delaware and New Jersey. On 10/24 we also forecast a horizontal size of 1250 km and a large storm surge. Last Friday, CFAN’s lead forecasters conducted a webinar briefing for over 400 people in the energy sector, to help understand and plan for impacts in the energy sector (power outages, energy demand, impacts on northeast refineries). One of my first blog posts at Climate Etc. was entitled Hurricanes and global warming: 5 years post Katrina. If you missed it the first time, have a look. Heck, even if you’ve read it before, read it again. The science has not changed, my assessment still stands. The only possible impact of global warming that I am seeing on the Atlantic hurricanes is the extension of the tropical Atlantic warm pool eastward (towards Africa), which means formation is occurring further east than previously and results in more TCs curving North into the Atlantic (so called fish storms). Note: the impact of warming on hurricane intensity seems theoretically robust, but impossible to sort out an AGW signal from the natural variability. Kevin Trenberth frequently says that global warming is affecting all of weather. He is probably right, but apart from the relative magnitude of the effect, this begs the question as to whether the effect is good or bad; arguably in terms of Atlantic hurricanes, the warming is resulting in fewer U.S. landfalls. So far, the 2012 Atlantic hurricane season has seen 19 named storms, 10 hurricanes, and 1 major hurricanes, currently tied with 1887, 1995, 2010, and 2011 as the 3rd most active season for which we have records. At the beginning of the hurricane season, I had a post entitled 2012 Atlantic Hurricane Season. Pretty much everyone was predicting below normal activity; revisions on Aug 1 raised the levels to closer to normal activity. Note: I do not make seasonal hurricane forecasts myself. Bottom line ENSO forecast: many forecasters think we are headed for El Nino by late summer/autumn. I agree that the most likely scenario is to have the ENSO index positive, it is not clear whether it will stay in neutral territory or make it to El Nino. Note: there is no sign of a Modoki (central Pacific warming), which is more predictable than ENSO. With regards to AMO and PDO, the AMO index is currently moderately positive, the PDO index is currently moderately negative. In this regime (which characterized the 1950’s), there were a large number of U.S. landfalls, particularly on the Atlantic coast. At the time I am writing this, 16 people have been killed and the early estimates of insured damage are $10-$20B. Given the magnitude of this storm, size of population impacted and concentration of property in the path of the storm, these numbers are really astonishing low. The forecast for this storm was spot on, and even the NHC pretty much had it right about 5 days in advance. FEMA and other agencies were on this early in the game. Mayors of cities were primed for effective action after Hurricane Irene. NCY Mayor Bloomberg has done an exceptional job in this regard. Sandy is a terrific example of how the U.S. is adapting to the elevated hurricane activity. Hurricane Katrina was a huge wake up call. A key element of this adaptation is good weather forecasts. Another key element is good partnership between the forecasters and decision makers. It is reassuring to see this success, particularly in view of the issues surrounding the Italian seismologists. Thanks, John. JC noted lesser activity, and then ends with elevated. Perhaps she meant elevated concern? Ms. Curry seems to be all over the shop. Just when it’s safe to think Ms. Curry has come to her senses, she slips back into the void of climate fraud. Judy says that 2012 is “currently tied with 1887, 1995, 2010, and 2011 as the 3rd most active season for which we have records.” Sounds “elevated” to me. She made an earlier point that there is a possible effect of AGW in “the extension of the tropical Atlantic warm pool eastward (towards Africa),” which would lessen landfalls. Clear? In any case it should be GW not AGW and even then it is not global. Not really, since they count every mosquito fart as a storm. ACE is a better indicator than how many got names. My 2012 seasonal forecast was hedged with such weasel words that I could not possibly be wrong. One step at a time, Professor Curry, you are educating them. Climategate broke three years ago in Nov 2009. AGW proponents lost the debate now struggle to get another four year (4 yr) extension on their sixty-seven year (2012 – 1945 = 67 yr) campaign to enslave us. I did have a comment left here??? are safe and missed out on property damage. An important point to note with this storm is that the correct action was to plan for an event this large and follow the plan. It was not to focus on reducing CO2 production. Current federally required disaster planning exercises have made a big difference in safety and recovery efforts. What might long term plans include? Perhaps evaluating water tight designs for doors to underground facilities but I suspect in most cases it might be cheaper to simply clean up after a flood. Plus, we cannot simply focus now on potential future floods. The next east coast disaster is likely to be of an entirely different kind: snow storm, ice storm, extreme cold event, extreme heat event, etc. Planning and resource availability are the key to handling future events, not concentrating on CO2. And making sure the FEMA director is competent rather than a political appointee with no experience! This brings up another issue that is a little irksome to me. News reports usually describe disaster response being run by FEMA. These days, disaster response is handled under the guidelines of the National Incident Management System (NIMS) – a government mandated set of procedures. NIMS has some irritating warts and quirks but, strangely enough for a government design, something that works quite well. A fundamental concept of NIMS is that all control is local. What a city does in an emergency is decided by that city, and likewise county and state. FEMA’s job is to make sure emergency responders and their administrative agencies are adequately trained and equipped before an incident, but only technical advice and logistic support when requested during the incident. FEMA director is not the person who bosses the response to and emergency. Think of like an fire in a city – it is a fire captain that bosses the firefighting, not the mayor (unless that captain had been elected mayor, of course.) During a disaster, the FEMA director’s jobs is to make sure those folks who are bossing things get what they need and even that job was mostly covered in plans and procedures developed long before the event. Don’t know if you’re reading (you do tend to comment on my comments religiously so the changes are reasonably good), but kudos for this comment on Willis’ ridiculous post at WUWT – (in which he tried to minimize the impact of Sandy at the same time as rather typically being bizarrely self-focused. Don’t see the purpose of this post except for self-aggrandizement. Whatever it’s precise nature on impact, it was and still remains, a terribly destructive storm. And not just flooding. Wind a major factor as well. It is refreshing to see a “skeptic” being a skeptic. I’m touched Joshua. To tell you the truth, I’m an equal opportunity old (61) grump. Willis bothers me at times. He’s often wrong and I’ve never seen him admit it. Even you Joshua, can manage a mea culpa from time to time. Which I respect. As for me, I spend half my life apologizing. It is reassuring to see this success, particularly in view of the issues surrounding the Italian seismologists. And your success, with CFAN. Congratulations for raising the bar in this and so many other areas and the real-world good that comes of it. ” In an early example of attribution science Peter Stott and colleagues took on the extraordinary heat waves that struck Europe in 2003 (killing thousands). Their conclusion? And that was the GOOD article? An unverified estimate gives ‘a much better handle?’ Since when did ‘if we are right, then we are right’ statements start moving science forward? This sort of thing puts climate science right up there with psychology as a ‘hard’ science. Honestly – molecular biologists wouldn’t pay attention to this stuff long enough to laugh at it. The utter lack of rigor makes it more boring than anything else. Good post Dr. Curry! I only don’t like the Orwellian ‘global warming’, it’s nonsense. Katrina was Katrina because New Orleans sits below sea level, and gross incompetence allowed a levee to fail. If the levee had held, would Katrina be a wake up call? Katrina would have caused a lot of damage in any case, but I can’t imagine it serving as an icon of hurricane preparedness if not for a single levee breach. Personally, living in Boston where hurricanes have caused damage in the past, I learned absolutely nothing about hurricanes from Katrina that I didn’t already know. The winds blow, the rain falls, and the seas surge. And carbon dioxide is irrelevant to any of it. One big lesson for a brief time was Texas politicians got to make fun of Louisiana politicians. Then Rita happened and Texas politicians looked like the Keystone Cops. Also, concentrating on New Orleans leaves out the devastation Katrina did to Mississippi, etc., which was no small potatoes. And the Dumbass Award again goes to JCH. Hurricane Rita was the fourth–most intense Atlantic hurricane ever recorded and the most intense tropical cyclone ever observed in the Gulf of Mexico … where 113 deaths were reported. Hurricane Katrina … Among recorded Atlantic hurricanes, it was the sixth strongest overall … At least 1,833 people died in the hurricane and subsequent floods. So Texas gets hit with a much stronger hurricane than Katrina and there are ten times fewer deaths as a result. We still get to make fun of Lousiana politician and as icing on the cake I got to make fun of you. Wow. You live awfully close to Salem to be uttering such blasphemes and heresies. Still kind of cultish there too given you recently elected a Mormon for Governor. There should be a long range plan to put electrical transmission lines under the ground. Power could be restored much faster (and it looks nicer, too). Yeah, the US looks like a third world country. You (and others here) should have a long range plan to cure your pathological blurting of the first stupid thing that comes into your head. Fat lot of good it did for NYC, eh? Saltwater conducts electricity really well and corrodes metal like crazy. The LAST thing you want in any area subject to saltwater inundation is having underground electrical conduits fercrisakes. There are very good reasons transmission lines are not undergrounded. So good that it is very unlikely you will ever see it happen. As for power restoration, it is hard to tell from the extremely poor quality news coverage – I doubt there is a single news person covering this storm who understands the difference between distribution and transmission systems – but I’m betting that most of the damage is to distribution, not transmission. Utilities are now under some very tough vegetation management requirements for transmission line corridors. Restoring distribution is a line by line, span by span process that is labor intensive. Utilities will be bringing in outside line crews, but with a storm with as widespread of an impact area as this means that several states will be competing for what is essentially a limited resource. 69 kV is probably what they use to feed their substations. We would call that transmission, but you are correct, terminology (along with voltages) vary from utility to utility. In a place like Manhatten, this would be placed underground due to space being at a premium. Still, in most locations transmission will be above ground, except for the most dense area in the urban core. As an aside, it will be interesting to see how long it takes ConEd to restore power to feed by underground lines. Undergrounding has the advantage of reducing or eliminating damage from things like trees falling into the lines, lines becoming overloaded with ice or the occasional car hit pole. It has the drawback of being a lot more difficult to repair when faults do occur. water per say will not always cause problems, but sea water may be a different story. Note: The term you used was “transmission lines” and this term is distinctly different from the term “distribution lines” which are used at the neighborhood/street level to move ‘power’ (transfer energy) from substation to the pole pig then onto (and into) the home. I meant mainly distribution lines. This is just a matter of money. Underground lines are more expensive and take longer to build. I am quite aware that high voltage transmission lines will stay above ground, but normally trees do not fall on these (one managed to do just that in Switzerland a few years ago, and that left northern Italy without power). It is the normal thing in Central Europe and works very well. Even the cable from France to England under the channel. When I owned a house in Florida, “coming home” meant crossing the bridge with the sign “Children and adults at play”, where the powerlines when underground. Looked splendid. Saigon, on the other hand, is horrible in this respect. The France-England interconnector uses a high-voltage DC cable as all long undersea high power interconnectors do. AC transmission lines may include short underground cables but it’s certainly true that almost all underground cables belong to the distribution network. Such cables may, however, be quite long and there are plans here in Finland to put a major part of 20 kV distribution lines underground, because the distribution at that voltage level is too often interrupted by severe weather conditions. The issue is controversial as estimated cost of underground cables is three times that of above ground network, but the issue comes up regularly after every major storm. 3x is probably the low end of the cost difference. 10x is not uncommon. In the US this debate about undergrounding comes up after every big storm. The end result is almost always the same. Once the politicians move on to something else to showboat over, reason and logic prevail – meaning once people see how much it costs, they decide they can live with the inconvienance of the occassional outage. Pardon: ‘To addition’ –> ‘To add to’ pfffft!!!! Tom Toles is very creative and takes chances–tops and flops. He did a lot of really good stuff when he was in Buffalo. Hilarious when you agree and maddening when you disagree. The problem is how do you argue with an editorial cartoon compared with say, how do you argue with a column or blog. Right or wrong, true or not true all good cartoons can be devastatingly visceral in the wars of persuasion. … targeted missiles that people don’t even have to read. Ever use a cartoon in a presentation? Probably. Think why you did it. Congratulations to you and CFAN for moving science forward and improving the image of scientists using models to predict the future. If I recall correctly, you stated that the models were OK, just that the modelers’ biases intruded upon model input. I had stated to Jim D in my reply several threads ago re: Frankenstorm that it appeared the storm’s turn to the left (Westward) was precipitated by a blocking high over Greenland: a right hook. I use Intellicast and the weather offshoot of Environment Canada to watch weather including storms. What I read indicated that Sandy steered into the cold front over the Mid-Atlantic Seaboard, as if drawn by a magnet, suddenly. This is the part that confuses me. If the cold front were such a powerful attractant, why didn’t Sandy move ashore earlier? My questions are: how do the upper level winds steer hurricanes? how do cold fronts precipitously attract air masses like hurricanes? I’m due for a left hook on my reasoning/understanding. Obviously I’m not a climate scientist, just a hobbyist in the field, but I would guess the relationship between colder air and low pressure systems combined with the higher wind velocities up near the stratosphere would be involved in the steering/attracting appearance to the storm pathing. Air moves up and down as well as laterally, and as you move away from the equator, the troposhere isn’t quite as “tall”. Hurricanes start out brushing up against the stratosphere near the equator and wind up being wedged down into a more cramped portion of the atmosphere, at times it can counteract the forces keeping the storm going, but when everything lines up right I would expect something like a lateral version of waves breaking on a beach. All the energy and mass in the storm system piled up vertically is pushed down and outwards, if it is pushed in the wrong directions it kills the storm, other times it can increase the wind speeds somewhat. Then you get a situation where an already “cramped” storm is funneled towards an even “shorter” portion of the atmosphere, and the same amount of energy winds up spread over a broader region. I think the way to visualize this is as an interaction of two cyclonic vortices that accelerate each other around a common center. While it is not obvious that the mid-level trough associated with the cold front is a vortex, it has what is known as cyclonic vorticity, seen in the motion around the trough. This vorticity center pushed east and drew the hurricane vortex to its north westwards. As with vortices, they have to be close enough to interact, so the sharp turn only came when they got close enough as the trough was moving east. Anyway, that is how I see it. Care to comment on the blocking high and its possible ties to the loss of ice this summer. I mean, it rather beggars the imagination to assert that such a melt would have no effect on subsequent weather, do you see any chain of causality that would lead to an increased probability of blocking patterns. Absent that structure is safe to say that the storm would not have taken the left hook it did. curious here. I’m not Doctor Curry…I’m not even very bright…but as far as I know there is no established causality between this years loss of sea ice and increased Co2. It is an issue that is very far from being settled. 2. In a warmer world we can expect less arctic ice, not more. 3. Its a warmer world than it was in 1979, and look, there is less arctic ice, not more. A) slower moving atmospheric waves. I’m certainly not going to insist you meant something you’re now asserting you did not. Of course I take you at your word, and I’m sorry for the incorrect assumption. However, given that at least part of Judith’s post is about the issue of (AGW) attribution, and given that you’re looking for in your words, a possible “causal chain”, and given that you are…as I understand it….something of a let’s say “luke-warmist,” perhaps you can understand why I made that leap. No one has been paying attention to the climatology of blocking patterns. Its about time they started. I think the increase in blocking patterns might be associated with the climate shift since 2002, and assoc with cool phase of the PDO. I hope people will start looking at this, I might write a grant proposal to do this myself. The information is available in the archives of the Met Office itself, from which many of the historic records were taken. A corrolary between blocking patters and the weather of the time would be perfectly possible to construct. Blocking patterns are not new. I was transfixed by the abrupt shift to the West of Sandy in projections. I saw on Intellicast.com the prediction bands. Hence, when your Week in Review mentioned Frankenstorm, I looked to the East and there was a stationary high pressure system and Great Britain was feeling the effects of persistent cold weather. That is why I thought about blocking highs, again. Now Yikess has referenced Tony Lupo in Columbia Missouri with a paper in Russian which may be informative. Steven Mosher linked to Francis & Vuvani 2012 discussing a mechanism for the impact of Arctic Ice loss and blocking high formation. My question: are there blocking highs impacting weather in both hemispheres? Would ice loss in the Arctic influence the atmosphere to form blocking highs in the Southern Ocean basin? As you mentioned that there may not be very much information on blocking highs in the literature, what questions would your grant proposal try to answer? I think many people are looking at blocking patterns and climatology. Dr. Francis from Rutgers is just one example. But more broadly, there are studies being done on the relationships between changes in Arctic sea ice and blocking patterns, changes in equator to pole thermal gradients and blocking patterns, alterations in planetary wave behavior and blocking patterns, increasing frequency of Sudden Stratospheric Warming events and blocking patterns, alterations in the MJO and blocking patterns, and more. There may some PDO connection (so good luck with your grant proposal) but the common thread among those areas currently being studied seems to be increasing energy in the Earth climate system being manifested in multiple but interconnected ways. Weather and climate change in abrupt and inexplicable ways, especially for those who cherry-pick data, ignore empirical data like this , pretending to be able to make scientific predictions of climate change !. That is why society is in its current mess, worldwide ! Thank you Professor C. What a breath of fresh air, given the nonsense that’s being spouted by people who should ….and probably do…know better. Bastardi and D’Aleo’s outfit, Weatherbell, also nailed this early on. Left unsaid is it may possibly not be related to snow melt and may not lead to increased probability of extreme weather. Whatever this is, it isn’t science. Whatever interest it holds is in the field of psychoanalytic study of the causitive factors conspiring to produce a pathological departure from the scientific method in the area of climatology. If it wasn’t for the possibility that this may lead to even more unnecessary government spending it would be entirely academic. Fortunately that possibility is become more remote with each passing day thanks to good old fashioned observation of nature taking precedence over observations of toy computer models of nature. Thank Gaia for small miracles, eh? Even when she displays the data demonstrating the advection of Arctic Sea Ice out of the Arctic, she just knooowwwwss that CO2 is what’s causing the decline. Arctic Sea Ice will start to increase one of these years. I want to hear from these people when it does. Why does one ( without good causal explanation ) invoke CO2? Advection also explains the melting permafrost and increasing Arctic Ocean Heat content? Nope. What increasing Arctic Ocean Heat content? When sea ice is thinner, more heat escapes. To the atmosphere. So without the blocking high it would have continued up along the coast and wacked Nova Scotia. Then that would have been evidence for global warming. Can’t loose. Or if it suddenly took a right hook …then that would have been ….. what? Yes, it’s been a win-win for the AGW-convinced for some time, but I wouldn’t like to lie in that bed in these times of low solar activity. I predict they’ll bring up more natural variability, aerosols, heat content instead of surface temperature anomalies, deep ocean and so on. The 30-year linear trend is dropping fast! Yeah, the middle of the US getting buried in snow in October is SO supportive of global warming. I believe one frequent commenter here, one that I’ve supported in that he at least made a short term testable prediction (Alexander Biggs?) that the excess of open ocean in the Arctic this summer would lead to increased NH snowfall this winter. It seems rather prophetic so far given winter is still two months in the future. Sorry. I’m bad with names. A quick google reveals it’s Herman Alexander Pope. Look at the ice core data. Warm ocean with open Arctic always results in more snow and cooling. Cold ocean with closed Arctic always results in less snow and warming. Ewing and Donn did predict that during the 1950’s, even before they saw any ice core data. I would like a link to the prediction by Alexander Biggs. No, I have never made predictions specific of snow. We don’t get much snow in Australia, although more on the highlands than Switzerland. But I recognise its importance: I’ve seen iceburgs floating down the Hull river in Canada. My predictions are all to do with climate and are at: http://members.iinet.net.au/~alexandergbiggs ‘An alternative theory of climate change’ . However I have suggested in comments to this site that the North Atlantic should be warmer because each side has many ‘urban heat islands’ creating a permanent plume of hot air over the N. Atlantic. (No disparagement of your politicians intended). I think the argument would go something like this. The loss of ice ( which is related to many things ) leads to changes in the circulation patterns, slower waves, larger amplitude waves, higher probability of blocking highs, higher probability of left hooks.this time of year. Now that is in fact a prediction made prior to this storm. Of course it doesnt prove anything. Bottom line. regardless of the cause we are still not prepared for extreme weather even if the future is like the past. Neither are we prepared for the Yellowstone Super Volcano, asteroid strikes, Coronal Mass Ejections on the scale of the Carrington Event which happened barely 150 years ago, airborne super flu, weaponized anthrax, suitcase nuclear weapons, inability to sell a trillion dollars worth of US treasury notes to China every year, $84 trillion in unfunded government liabilities, and so on and so forth. An imaginary climate change threat that even the IPCC admitted would be a net positive thing until at least mid-century seems like a rather remote concern in comparison. But that’s just little old me the unrepentant realist with more than a lick of common sense and little time for liberal academic pinheads and their disconnected-from-the-outside-world prognostications. So sue me. calling the threat imaginary is pure head in the sand denialism. It’s like the “Chicken Little falling sky” threat. Or do you prefer “illusional” – or how about “delusional”? What of other factors that affected or influenced cyclogenesis (continued regeneration of the cyclone) in Sandy? By that, I mean, ingestion of, or perhaps starvation of necessary warm, moist air ‘feedstock’ to keep up convective storm activity? Aside from whether the affects on weather will be good or bad, this gets at the heart of the attribution issue, IMO. It gets to the point that you cannot dissect out that one storm’s formation, location, or intensity is caused by anthropogenic factors, but another is not. A wholistic approach is the only logical approach. Everything that is happening on a global scale is what the Earth climate system does when approaching 400 ppm of CO2 (and rising to this level over a time horizon of just a few centuries). The contributions of other atmospheric chemistry changes over the past century must also be factored in (methane, N2O, ozone, aerosols) along with of course natural variability and cycles. Thus, the quesion as to whether Hurricane Sandy/Frankenstorm was “caused” by anthropogenic global climate change is wrong thinking. There was no single cause, but the whole state of the system (including natural and anthropogenic factors) is the “cause”. More importantly, these kinds of megastorms may or may not increase in frequency along any specific area, but what we learn by each one that we do get to is the wisdom gained to thereby prepare and harden our infrastructure against future super-storms and is one more step in the process of human adaptation to a changing climate. Yes but that’s as informative as saying everything that is happening on a global scale is what the earth does absent the second coming of Christ. In other words the null hypothesis that this is what would have happened regardless of Christ or anthropogenic CO2. If you don’t know that you’re stupid, Gates. If you do know it you’re dishonest. I think it is true to say that this kind of interaction with a southward extending trough over the US is a late-season phenomenon, and could only be connected with AGW to the extent that more late-season storms may occur, which I am not sure has been proposed, but would not surprise me. The flip side of this, of course, is that cold fronts also will shift later as the winter gets more delayed under AGW, so it may be a wash.
Perhaps we should just over-insure instead; maybe pay for standing-forces of men and equipment equipped with large pumps, K-rations, extra HV transformers (for use in substations and distribution networks in neighborhoods), ready to be mobilized and dispatched at a phone-calls notice? A ready-to-mobilize force with critical assets at hand: Cheaper! So far, the 2012 Atlantic hurricane season has seen 19 named storms, 10 hurricanes, and 1 major hurricanes, currently tied with 1887, 1995, 2010, and 2011 as the 3rd most active season for which we have records. Since you seem to think that named storms is a meaningful metric – do you have any comment on whether the number of named storms has been increasing decade over decade? And if they have, any comment on the meaningfulness of that trend? Trend of named storms is meaningless, I look at hurricanes when I do climatological analyses. I assumed it to be meaningless, which is why I was surprised to see you mention it in your post. It is generally the metric people use when they talk about inactive vs inactive hurricane season. How is the trend effected by steadily increasing powers of observation? How could every singletropical storm that never nears land and barely, briefly reaches the definitional sustained wind speed to qualify for a name be recorded before the Doppler Weather Radar was invented in the 1970’s? Saying there’s an increasing trend of named storms is like saying there’s an increasing trend of named extra-solar planets. It’s not because there’s more of them it’s because we’re more able to identify them. I this case, as with sea ice, it would be better to only talk about the satellite era. In 1926 some people in Miami were not aware that a hurrican has a part coming behind the eye…Sometimes people were not aware the a storm was coming. I just hope their supply of names is sustainable. As a followup to Steven Moshers excellent question, what does the historical record and paleoclimatology tell us about the frequency and climate relationships of these so-called Frankenstorms? Wake me up when agricultural productivity starts falling instead of rising. It too parallels increasing anthropogenic CO2 emission for a number of well known reasons from warmer northern weather to lack of dust bowl conditions to fertility of the atmosphere to increased drought tolerance to fossil fueled powered large scale farming equipment. So far the upside appears to far outweigh the downside. The upside is readily apparent while the imagined downside requires an almost ridiculous clutching at statistical straws and faith in toy computer models with demonstrably poor skill. And as a part of evaluating the question of whether the effect is good or bad, consideration needs to be made to the nature of the relationship between the effect on the weather and the effect on society. For example, a fractional increase in the severity of a storm does not necessarily affect society with the same fractional magnitude. (Similar consideration might be made w/r/t the potential “benefits” of a warmer climate). Certainly, the nature of relationship between fraction of change and fraction of effect is important, with follow-on (important) implications to the debate between the relative merits adaptation and mitigation, respectively. Imo that question is of minimal importance in that form because it is to general. Of much greater importance is if any action taken today would produce a beneficial impact on the weather worthy of the cost to those incurring the expense. I don’t see how you separate the one question from another. At the risk of incurring semantic criticism, I’d say that your delineation rests on a false dichotomy. And even if you could separate them, I don’t see how you attribute value proportionally; why is one question more important than the other. And w/r/t the specifics of the question you consider more important, I hope that when you say “the cost to those incurring the expense” you are considering that any expense might reflect a net benefit. Yes, the cost might incur a benefit. I am not sure what that benefit may be however. Imo, it seems appropriate for those who wish to have a cost incurred to be able to define the benefit of the proposed expense. My general concern is that I do not see any clear benefit for the vast percentage of mitigation actions being proposed to be implemented today. Many of the proposed actions seems to be advocated more on the idea of “doing something” or “leading the way” without much fidelity on what will actually be accomplished in return for the expense. The science is pretty clear Joshua. There is heating in the pipeline. heating we can do NOTHING to mitigate. We are seeing the effects of climate change today, there is nothing we can do except adapt in the short term. Stop being anti science. The frankenstorm is directly tied to global warming. There is heat in the pipe. We will see more frankenstorms that mitigation can do nothing to stop. My impression is that the science is not settled, and that the ratios of which I spoke affect the relative advantages of different emphases. I think the discussion is worthwhile. I don’t see either approach as all or nothing, and I haven’t seen what seems to me to be a valid argument stating that all or nothing on either side is the way to go. But given my perspective, I certainly would like to see how advocates of all adaptation (and no mitigation) propose to comprehensively address the disproportionality, on a global scale, between those who contribute most to ACO2 and those who are most likely to absorb the potential impact of climate change. Haven’t seen that either. If you have something you’d recommend, I’d appreciate a link. I should add that those who contribute a greater proportion of ACO2 are less likely to absorb the impact for more than one reason, and one of those reasons is that they have greater resources for adaptation. That doesn’t seem like an argument against adaptation – but it is an important consideration as one weighs the relative cost/benefit of adaptation vs. mitigation. Seems to me (since I don’t think the science supports a slam dunk either way) that the cost/benefit comparison of adaptation vs. mitigation must depend to some degree on which stakeholders are doing the comparison. Imo, your reasoning is flawed on several levels. One level is that it seems to assume that the damage due to bad weather is a result of climate change and not due to the fact that many countries have not made preparations for bad weather regardless of whether it gets more severe due to climate change. If countries do not build infrastructure today is that a “problem” for the US citizen to get involved in to improve or should each nation be responsible to take care of their own citizens first? A second level is that your argument assumes that the impact of releasing CO2 has been a “net negative” to the countries in question and that is not necessarily the case at all. The poorer countries around the world have received the benefits of energy and products produced as a result of CO2 having been released. Imo, there is no debt owed. Imo, if a person feel otherwise, they are free to make donations to the economies of whatever nation they so choose, but it should not be the responsibility of the US taxpayer. No. I am not making any such assumption. I simply stated that the resources available are different. The level of impact is due to both a ()likely?) differential impact of weather events as well as a clear and unarguable difference in resources available – in addition to whatever mitigation strategies have already been employed. I am less concerned than you in finding some justification for that difference in available resources and existing mitigation (and I suspect I see the related calculus as more complicated than you), but that doesn’t make the assumption you attribute to me. I have not made that assumption either. I have not made any statements w/r/t “debt owed.” We might also discuss the calculus related to the current balance sheet – I suspect there would be much disagreement – but that doesn’t change the question of whether going forward, per capita contribution of ACO2 will be proportionately greater in those countries who will feel the impact less for a variety of reasons. Finally, as you and I have discussed, my feeling is that if through a democratic process Americans on the whole feel there it is valid to donate your (and my) taxes to helping people in ways you don’t agree with – be it people in other countries facing climate change impact of people in this country who can’t afford medical care – as a member of this society you can try to change those policies, accept them and complain, or choose to live somewhere that you won’t have to suffer such injustice. Fortunately imo, there is an extremely low probability of a majority of Americans wanting to pay higher taxes in order to send funds to countries that have not built proper infrastructure (largely due to corruption). This is especially true today and will be for the next decade given our (and the EU) budget situation. With all due respect, you do seem to avoid the discussion that you do not know any positive impact of mitigation actions. If atmospheric CO2 is at 460 vs 470 in 2050 so what was the benefit to the taxpayer? Sorry – this belongs here. I wouldn’t want it to be misinterpreted as a response to Gil. But you continue to not be able to answer what will be accomplished as a result of implementing mitigation actions. That is not quite true. We know taxpay funds will be made to disappear from other priorities as a result of spending on you goal of implementing mitigation strategies. Suppose for a crazy moment that what the IPCC says about the probable net benefits of rising CO2 through mid-century is correct. In your fair distribution logic shouldn’t the current largest contributors be rewarded for it at least until such time as the downside demonstrably outweighs the upside? Should we not also take into account the massive food surplus the US produces as a direct consequence of mechanized farming that relies on fossil fueled equipment to do everything from prepare the soil to refrigerating the harvest for transportation? What about the might US military machine that won two world wars and would not have been possible without fossil fuel? Who pays us back for that? What price is the blood of fallen American soldiers worth per pint? David Springer the Nazis used oil. Please don’t support the Nazis. Joshua @ 4.11, you are suggesting that people in LDCs will suffer most from any adverse impacts of climate change (from AGW presumably). I have seen frequent arguments (e.g. the Copenhagen Consensus) that rather than use resources to reduce CO2 emissions, they be used to deal with more pressing LDC issues, including fostering economic development, which will both have immediate benefits and increase their capacity to deal with any adverse impacts of climate change. Many who oppose costly emissions-reduction action argue that, whether or not AGW is occurring, such expenditure is sub-optimal and does not make the highest contribution to people’s welfare. FYI- I am not advocating all adaptation and no mitigation. I would agree that there are actions that can be taken that make sense that will mitigate a CO2 rise. An example would be building modern nuclear power plants or adding cost effective solar power generation to reduce demand for alternative sources. I am a big believer in the power of human capital and the advantages of fostering economic development in LDCs (the difficulty of how to effectively fostering economic development notwithstanding). And certainly, we have to consider that efforts in those areas return benefits w/r/t AGW – for example educating women reduces birth rates which will influence ACO2 emissions. I agree that global-scale efforts to mitigate potential climate change impact on LDCs needs to be balanced against other efforts at helping those countries – whether we’re talking about fostering economic development or aiding with adaptation to climate change. So then the difficulty is in how to read the scale. I am not convinced by what I’ve seen so far in how people try to assess the cost of mitigation. Mostly, the analyses seem to me to be driven by partisan operating assumptions. More specifically, I don’t see how anyone can claim to quantify the costs of mitigation w/o a full-cost accounting of the current use of fossil fuels (kind of a reverse opportunity cost consideration – “opportunity gain.”). Seems to me that any conclusions about how “expensive” mitigation is much, necessarily, be assuming an accounting for full fossil fuel usage – but if a full=-cost accounting hasn’t been done then due diligence hasn’t been performed. So a large in size, low wind velocity hurricane, in its random path that just happens to make landfall in the most populated area of the country suddenly makes it a Frankenstorm? I don’t think so. The alarmists have been losing badly the last 3 years or so. You should expect that they will try and use any storm to their advantage. If the number of hurricanes was cut in half, and their intensities cut by 50%, there would still be landfall hurricanes that did as much or more damage that Sandy, on a regular basis too. What total, unadulterated horse-hockey. Please show your scientific proof! Well the temps don’t show it and the ARGO bouys don’t either. Please help the science along by telling us where it is, and when it’s going ta git us. Richard Tol pointed out a recent study that showed the net effects of the current rate of warming will be positive overall. I have urgent things to attend to right now, or I would look it up for you. It has been warming since the last glaciation, and the Little Ice Age and cooling since the Holocene Climatic Optimum and 1998. The key issue is what is the magnitude of the anthropogenic contribution, will that be “catastrophic”, and what are all the significant uncertainties involved. not without discarding over 300 bouys that show substantial cooling they don’t. Quite a little fight going on behind the scenes on that little issue. BTW the temps do show it. The warming trend from 1975-2012 is the same as the trend from 1975-1997. Those who claim the warming has stopped since 1997 are simply liars. No, lolwot. 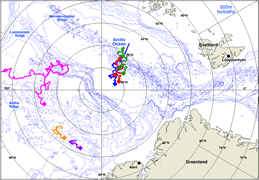 The ARGO buoys are not showing warming. I just read about an analysis that argues that Paul Ryan’s budget proposals would lead to a 50% reduction in the accuracy of NOAA’s ability to predict blizzards and hurricanes. Please consider not only the impact of that budget reduction not only in terms of #’s of people suffering the impact of severe weather – but also the cost ineffectiveness of cutting services that would save money in the long run. This is an example of the downside of valid libertarian ideology being stretched to the point of irrationality, IMO. It sounds like you read an analysis of a Paul Ryan proposal to cut the budget of the NOAA and assumed that the analysis was accurately reflecting the reality of what would be cut. 1. Government spending must be cut to balance the budget as well as tax increases. There will be many unplesent cuts. That is a fact. 2. The NOAA has invested in many wasteful activities such as the development of global climate models when local or regional models would have been more useful. 3. Less funds to the NOAA and better management of the departments goals will likely result is more efficiently spent funds. I see no evidence that there will be a reduction of beneficial services. Where will the money come from to replace failing satellites? I was working for NOAA at the National Severe Storms Laboratory almost 40 years ago. I was proud of it then. NASA was still a bright shiny technological star and NOAA was doing good things. I’m ashamed of them today. They’re a huge inbred black hole into which the taxpayers cast money and get nothing back out in compensation. The reality is many US programs will be cut much further and the proposed cuts to the NOAA are modest. People seem to like to pretend that we can spend more than we generate without consequences. Sorry, but that is simply not reality. The same way that individuals can not live off their credit cards forever, nations can not sustain unsupportable levels of debt. It is much easier to point out to people the bad things that we will miss when the budget is cut than it is to actually take the financially responsible actions necessary to balance the budget. It is interesting that you are not skeptical of an analysis by the Washington Post. Do you not find it likely that the Post would skew their analysis to show the proposed budget as unfavorabily as possible? David Kendall of The Third Way the new progressive health care / rocket scientist in charge of Joshuan statistics. In the near term, function 300 would be 14.6 percent lower in 2014 in the Ryan budget according to the Washington Post. What is in function 300? For Sandy, balloon launches *were* scheduled to be doubled, yielding radiosonde data every 6 hours (instead of the USUAL 12 hrs). You’ve gone completely over the edge. You may need a vacation. I suggest somewhere farther inland and a bit further north so you can get some direct experience with a harsh winter and a majority of sane people in the surrounding area. Montana maybe. Or North Dakota. Idaho would be too much of a culture shock. That’s the problem with adaptation – it’s always a response, which means we’re always under-prepared for what comes next as we adapt based on the previous experience. Adaptation is the Pavlovian response. The insufferable Texas Fire Ant uses the “just cope with it” strategy whenever I use any manner of directly-applied poison, poisoned bait or disruption with a stick; they are doing just fine as a species, unfortunately (back every year, year after year, that I have seen. Cold winters *do* seem to set them back a bit though) ..
That may rank in the top 10 of silly comments. Adaptation means building infrastructure to prevent or at least minimize harms which would result from extreme weather. The benefits are immediate. The example of differences in harm to a population compare the harms that come to people from bad weather in the US to India. Mitigation means reducing reducing the emissions of CO2 now in the hope that it will result in more favorable weather in the future. The question that advocates of mitigation can’t answer if what the benefits will be and when these hoped for benefits will occur. The entire idea is based upon hope and no reliable data. In having to choose between adaptation based on experience, with factors added in for extra safety margin, and mitigation based on nothing more than models which have extremely poor prediction capabilities, there isn’t much of a choice. Do we ocassionally see instances where man’s attempt to engineer or adapt his environment fail? Most certainly. Do we see this happen most of the time? Most certainly not. The only evidence for “heating in the pipeline” is the disparity between the calculated amount of temperature rise we ought have experienced and the estimate of the mean temperature rise that we have experienced. The latter is a subject of some debate, and the former is based on the assumption of an possible equilibrium without any details of how the CO2 affects the mechanisms of heat transport. Tying a particular recent storm to global warming when the record of the last 100+ years shows no trend toward increased frequency/intensity of the cyclonic storms is a stretch. This storm seems to have possibly broken a record for diameter, but not total energy, storm surge, wind, economic damage (so far), total rainfall or anything else. A non-record in a non-trend is evidence for a non-association with warming. MattStat, I agree with you about the hurricane point, but I don’t agree about the warming in the pipeline issue. The idea of there being warming in the pipeline is founded in relatively simple science. We know equilibrium in a system like this wouldn’t be reached overnight. It will take time. The question is, how much time? A follow-up question is, how much warming is actually in that pipeline? Will we see 80% of the effect of a change in forcings within a year, and the rest within five more? Or will it be 50% within a year with the rest coming in over the next 50 years? There’s a lot of uncertainty in how long it’ll take the Earth to fully respond to increased greenhouse gasses (and what the distribution of that response would be), but it’s not going to happen overnight. Brandon Shollenberger: The idea of there being warming in the pipeline is founded in relatively simple science. We know equilibrium in a system like this wouldn’t be reached overnight. Well, that first sentence actually does not contradict what I wrote, especially in light of the subsequent sentence that we do not know how long it would take to reach equilibrium. Therefore, the claim that there is “heating in the pipeline” is based on the disparity between the heating that has occurred and the predicted equilibrium. Yes it is simple science, a sort of “flat-earth, radiative transfer, equilibrium” approximation of doubtful accuracy. I say of “doubtful accuracy” because other equilibrium approximations are known to have inaccuracy — such as the disparity between the pole temperatures and the Equator temperature. The Earth climate system never has been in equilibrium and is not in equilibrium now. Studies of high-dimensional nonlinear dissipative systems, even simple systems with uniform input on flat surfaces, do not display equilibria (I frequently cite the Kondepudi and Prigogine thermodynamics text, because it is a thermodynamics text, but there are many texts and studies): there is no reason to assume that the Earth climate system ever would, especially given that it never has. It’s quite acceptable to make simplifying assumptions for the sake of deriving some results (to make the problem tractable), but then you have to show that the results are accurate enough for the task at hand. To understand and predict what a doubling of the CO2 concentration will produce, I think we need a complex science that includes the effect of the CO2 on all the energy transport systems in the whole system: clouds, interception of light from the sun (c.f. the famous Trenberth et al energy flow diagram), thermals and clouds, Hadley cells, and others. It will have to be fairly specific to locations, seasons, temperatures and humidities. Everything that happens, that get gets averaged across time and space, happens because of the particular conditions at specific times and places, not the averages. Simply working with mean flows, as in the Trenberth energy flow diagram, probably does not yield sufficiently accurate models. I think it would be a step in the right direction if climate scientists abandoned the equilibrium/flat Earth assumption altogether for forecasting climate change. It does well for contrasting Mars, Earth and Venus, but not for small effects like the effect of increasing CO2. Heat goes in more rapidly than it emerges, then the effect is smoothing over many centuries, this is a moderating effect. Why not ask your next professor, in two-hundred years? He should know by then, I would think. An incredible statement. From anybody. But especially so from Mosher, who in the past has always seemed to quite scientific in his outlook. look very carefully at what that argument is doing..
Its showing you how an alarmist position can be used against the proposition that we need to mitigate..
Its not one or the other. The more mitigation now the less adaptation later. You can, though , say that global warming will increase the likelihood and frequency of similar future storms. What’s the (observational) evidence that global warming will increase the likelihood and frequency of similar future storms? Furthermore, if it’s true (I’m not convinced), the globe will cool in the next decades; does it mean it will decrease the likelihood and frequency? What’s the (observational) evidence that global warming will increase the likelihood and frequency of similar future storms? Dr Curry in her scientific papers has stated the evidence in there. Mind you, Ms Judith, on this blog, seems to want to give a different impression. Give the audience what it wants. How does the alleged AGW affect the climate regimes/oscillations (AMO, PDO, NAO…)? How would they look like since ~1960 without the ACC? Would the warm PDO (~1980-2000) be less warm? Would the cold AMO (~1960-1980) be colder and the warm AMO (~1980-2010) warmer? should read less warm or colder. Actually I am just trying to show how a particular line of argumentation would work. That is. I can appeal to “the science” to argue that we need to focus on adaptation. Steven Mosher: That is. I can appeal to “the science” to argue that we need to focus on adaptation. I do that all the time. “The science” provides evidence that extremes and near extremes of hot, cold, wind, rainfall, drought etc will recur and recur, so that we need to increase our investment in preparation and adaptation. My favorite examples are irrigation and flood control infrastructure in the Indus Valley, in California, in Queensland NSW, and in Texas. Responsible parties on the East Coast of the US have long been aware of these recurrent extremes, and have preparations in advance and teams of experts following on to facilitate adaptation. Preventing global warming, even were it to be possible, would not eliminate the need for such. Please show us this linkage between CO2 and a slow moving marginal hurricane that has a surge in the same range as historical precedents. Un necessary to the argument and beside the point. It is just my opinion, but copycatting the media by adopting their hype driven terminology is rather simple minded. As one who is not simpleminded, you should know better. I have difficulty with this assessment; and I have no expertize on this subject. Another measure of what constitutes an active season is the ACE value. The ACE value for this year is currently 121, slightly above normal. But the ACE value divided by the number of named storms, or number of hurricanes, is below the average of recent years. What is the best metric for assessing what is, and what is not, an active season? I do believe Ace values have generally decreased over last decade. From what I understand (which is damn little) it’s a more meaningful metric than number of named storms. I think the higher the Ace index, the more likely there will be tropical storms. If Ace values are headed down, and Co2 up, does that not argue for a lack of correlation? If ACE is down and named storms is up then that means that energy per storm has declined. Sounds like an improvement to me. So R gates how much of that rise in Co2 is man caused and how much is natural. Most people yelp about a rise is co2 but fail to break it down between man and natural, why is that? Maybe if broken down evil man would not look so scary? Where has the global warming been for the last 16 years? How much of the warming before flatlining was man caused compared to natural? the vast majority of CO2 rise is manmade. there has been continued global warming in the past 16 years. The vast majority of CO2 emission is natural. It rises naturally with temperature increase which is evident in glacial/interglacial cycles. Solar magnetic activity has a marked effect on temperature which you inadvertantly discovered last week when I pointed out that the scribbled curves you inscribed over the decadal trends in the instrument record from 1950 to 2010 reproduced the 11-year solar cycle curves during that time. Anthropogenic emission is likely a red herring given the physical requirement that the ocean release or sequester more or less CO2 with change in surface temperature. During the last 50 years we’ve experienced what’s now named “The Modern Maximum” for solar magnetic activity and for the last 30 years we’ve been on the warming side of a 60-year sine wave in ocean surface temperature fluctuation. The smart money says we’re in for falling temperatures for a couple of decades and in fact the past few years there has been a precipitous and alarming decline in global average temperature of 0.175C which translates to a decadal trend of -0.6C per decade. One more decade at the past 3-year rate of decline and all the warming since 1880 is completely wiped out. That’s not good. The weather sucked back then. The rise in CO2 is mostly human caused. That’s why CO2 levels are now at million year highs. It fits. I already knew it. See for example this figure from the paper by Foster and Rahmstorf?. Note the 11-year cycle impact in the lower graph. It is surely you and other skeptics who are dismissing that solar influence. If you did accept it you would realize the warming since 2002 has been masked by a cooling part of the cycle. And then you go and plot the trend in global temperature since 2010, an El Nino year. 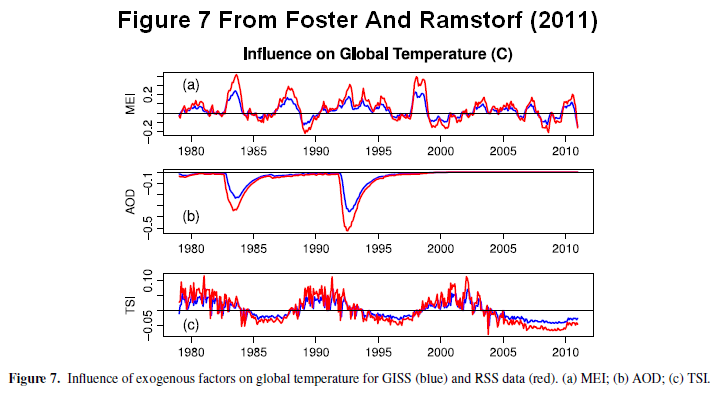 You have a lot to learn from Foster and Rahmstorf. We’d probably be around 275 ppm CO2 sans humans– maybe a bit lower. But don’t forget about rises in methane and N2O as well. They’ve also seen significant increases and certainly those rises are related to human activity. In the central Maryland area, the reporters doing the TV coverage noted most hurricanes are warm events but nearly all the reporters doing outdoor shots in the wind complained of how cold it was. This begs the questions, was this a fall nor’easter that swallowed the energy and moisture from the hurricane or was it a hurricane that got enhanced by the nor’easter. It seems like semantics but the cold temps make this event feel much more like a nor’easter than a hurricane. Warm oceans and open Arctic produce snowfall that lowers Albedo and promotes Cold Arctic Air Masses that move down and change the whole ballgame. Every year that has record Low Arctic Sea Ice Extent, there will be huge snowfalls that will set records in the Northern Hemisphere. This year, already, in the Central and Northeast US. Last year in Alaska, Canada, Europe and Asia. Year before last, in the lower US. When the oceans are warm and the Arctic is open, it snows much more and that keeps Earth Upper Temperature well bounded inside the limits of the past ten thousand years. We are in the warm part of a natural cycle that has has been well bounded for ten thousand years. This fall and winter and spring will have many record snowfalls in the Northern Hemisphere. This will happen again, as it has happened every year that had record Low Sea Ice Extent. The CNN news showed the power outages in nineteen states. It showed North Carolina as being mostly without power. I just talked to someone Southeast of Raleigh. The only power outages in NC are well East of Interstate 95. This is Alarmist exaggeration, most likely with intent to influence the election. Why else would a News Channel take a situation that that is plenty bad enough and try to make it look much worse? More honest and accurate reporting should be self imposed. Assuming that the reporting was inaccurate and dishonest as you assert – you can’t think of any reason, other than “most likely” trying to influence the election, why the reporting was done as it was done? Do you really consider that argument to be skeptical? Glas to see you got through it ok. How did it go with your partners parents? I stated my opinion about their motives. The reporting could be dishonest, or inaccurate, or both. In any case, it does help me to be a skeptic about anything I hear and encourages me to seek additional sources for news and other stories. If they are trying to influence with false stories, that is bad. If they are reporting stuff without checking the facts, that is bad. North Carolina outages. Compare with CNN showing most of the state without power. Compare this to CNN saying that 19 states were without power. Besides, I know plenty of couples who refer to their ‘other-half’ as their ‘partner’. David Springer’s comment is just… unacceptable, to put it mildly. People sometimes take blog comments too seriously. No one is harmed by Springer’s homophobia any more than they are harmed by his political extremism or his faulty logic. Consider sunlight, disinfectant, and all that. Basement was completely dry – only a few branches down and they missed the buildings and the cars. A neighbor two houses over lost a beautiful and huge cherry tree – but amazingly it missed their house. The “in-laws” (sometimes I call them outlaws) didn’t fair so well. My girlfriend’s mother refused to leave the house (she insisted on finishing her dinner first), even though her son explained anxiously (he doesn’t scare easily) that the house was clearly unsafe. He had to call the cops and once they looked at it they said that no one could remain in the house any longer. The in-law stayed with their daughter who lives nearby and who also has no power! Today their house was officially condemned by the fire department officials until it has been repaired – which could take weeks if not months (kind of the reverse of what Cheney predicted about the invasion of Iraq). We’re trying to figure out the next step – move them down to our house until their’s gets fixed, move them up to Boston where the other sister lives, put them up in some temporary residence near where they live…. They aren’t going to be happy about any of those arrangements – they’re from a tough stock and tend towards stubbornness – but it is an excuse to spend more time together, something that becomes more important the more frail their health becomes. We”re just outside of BOston, and I have to admit I remain somewhat disturbed by how fervently I was wishing for the storm to hit further south, rather than new england. We human beings are a deeply selfish race. Difficult decision, if I were them I would want my independence especially if it was likely to take several months before they get back. Renting A nice little house somewhere close by might suit them. For what it’s worth Joshua, just the prospect of living with my in-laws, however temporarily, is enough for me to reach for the bottle after 25 years. Consider this – hanging at Climate Etc. has accustomed me to interacting with crotchety old folks who sometimes act irrationally. Where outside of Boston do you live – I lived in that area (a number of different towns) a number of years? and I have to admit I remain somewhat disturbed by how fervently I was wishing for the storm to hit further south, rather than new england. Alcohol consumption has increased markedly the northeast U.S. in past 15 year with Vermont leading the pack. Obesity is also up while, ironically, so is the amount of exercise people get. The culprit of course is the huge decline in tobacco use. Getting stupider is also a consequence due to nicotine, aside from being a great appetite suppressant, is an accelerant for chemical communication speed between synapses. I meant ACROSS synapses not between. The only actual “law” of unintended consequences is that people will selectively choose unintended consequences to confirm their biases. You’re actually going to claim the law of unintended consequences to compare the consequences of people quitting smoking to people continuing to smoke? Really – the logic of a “skeptic” is a beautiful sight to behold. “nicotine, aside from being a great appetite suppressant, is an accelerant for chemical communication speed between synapses” – David. Yeah, ’cause tobacco is the only source of nicotine. “people are getting stupider” – David. Feel free to offer a better explantion why obesity and exercise are both on the rise? Rise in alcohol consumption since 1995 in the northeast I’ll attribute to depression over lack of success in stopping human population growth. If i was packed in like sardines with y’all in that suckass dirty northeast coast I’d be depressed and drink more too. There’s more. Smokers tend to die from incurable diseases before they’re old enough to have medicare pay for it. Fat people tend to linger well past that point with expensive to treat side effects of diabetes and chronic joint problems. If people want to smoke it’s not my business to discourage them and it’s probably a net benefit for everyone else because they tend to die before they become a burden on society like fatbodies. This is Alarmist exaggeration, most likely with intent to influence the election. I note this comment for the benefit of all of those who think preposterous the possibility of some significant correlation (notice I didn’t say causality) between “skeptics” and conspiracists. I certainly hope that Frankenstorm/Superstorm/Hurricane Sandy serves as a vehicle for examining the relative merits of adaptation vs. mitigation (as it is a useful evidence for evaluating each approach), as well as the cost/benefits the “cost” vs. benefits of policies focused on addressing climate change. Given that the partisan rhetoric has already grabbed a hold on the discussion about this storm, and people seem more focused on confirming biases than anything else, I decided to consult my Magic 8-Ball to get a prediction. In other words, same ol’ same ol’. As soon as those who support mitigation actions can tell us what benefit will be accomplished in terms of preventing the feared harms. With an adaptation actions you know what you are buying. With mitigation actions you seem to be buying a dream. Yes, but aren’t you impressed by the relative lack of casualties? This obviously could have been much worse. Isn’t that adaptation in action, or am I misinterpreting the word? ONe thing we clearly could and should do is be to put electric wires underground. Caualties have just begun to accure. The result of 7+ million people packed in like sardines with no electricity for several days is not going to be pretty. Virtually everything in the modern world relies on it from water pumps to sewage pumps to cash registers. Riots are next on the hit parade. I expect the death toll to handily exceed Katrina if electricity isn’t restored most riki tik. We were without power for 3.5 days in the Jan 2011 Brisbane floods, we live in the inner city, no major dramas. Of course, the power outages weren’t as widespread as the NA ones. Holy Short Circuits, Batman! Underground is the worst possible location for electrical conduits in any area subject to saltwater intrusion. Saltwater is highly corrosive to most metals and it conducts electricity fairly well too. It’s pretty much impossible for high tension lines as they need a large physical separation to prevent arcing. Once saltwater penetrates the conduit on low tension lines it’s all over except the crying because it conducts so well. You could probably use a modern polymer conduit instead of stainless steel but it only takes one leak and then you’re screwed. This quote would be applicable to most threads in climate blogs, but it really, really applies to fevered claims of attribution. Of course another effect of climate change will be to effectively make storm surges higher as sea level rises. that’s enough to add another foot to storm surges. Probably more as I expect sea level rise will accelerate with more warming, just as it has done over the 20th century. By 18 cm per century. But that’s not what caused all the flooding this time. The full moon was also a factor – it made high tide even higher. this is exactly when sea level rise will cause disasters. It will make the extreme full moon/hurricane situations produce even higher surges. Sea level rise is decelerating and even plateauing lately. When the cooling really kicks into gear, it will start dropping. But even if the rise continues, what have humans got to do with it? It seems like the unusual aspect of Sandy is that it was prevented from speeding up its transit time. If I read the history correctly, it seems much more ocmmon for storms to rapidaly travel up the East coast and that slow transit times are very unusual. Are yo uaware of any other storms that have had this behavior? I am unable to find any. What do you believe caused Sandy to slow down, or at least remain at constant speed, for so long? A direct approach from the east is also unusual and it was just bad luck that landfall happened to coincide with high tide. The proverbial perfect storm. I’m thinking it’s going to depress voter turnout enough in Philidelphia that the state goes to Romney. You know what they say about PA; Philadelphia in the east, Pittsburgh in the West, and Alabama in between. It’ll go Republican easy peasy without Philly. Natural disasters are legally termed “Acts of God”. This one might be an act of the Mormon God! If George Bush had not caused there to be a full moon yesterday there probably would have been less devastation despite the deep and calamitous climate disruption. Is this is the day when the seas recede”? Sure do, congratulations. I used to live on the edge of the Coral sea in far north Queensland and lots of predictions were made on where the cyclone would cross the coast. However in the 1980’s predictions were often hundreds of kilometers out. Hopefully their accuracy will have improved. In Australia, the community has been deeply split over the accuracy of the IPCC climate predictions. The Gore film had a big impact here as it did in the US, but as the more extreme predictions have not come to pass, people are questioning them. So it is timely to acquaint or remind people of the IPCC’s mistakes,like their failure to include climate before the 1960’s and ignoring the amazing turn-around in 1940. Eventually the IPCC’s story will run out of steam but not before it has inflicted major damage on the world economy. Prof Curry: Hurricane Katrina was a huge wake up call. If my reading is indicative, it encouraged other locales to recheck their emergency preparedness procedures as they always do after disasters, theirs and others’. Only in NO was there any waking up. There was a spike in climate/hurricane alarmism for a year or two, which may have heightened awareness to the overall decline in hurricane frequency that followed, but not much else. Perhaps my view is because where I live the risk is from firestorms (Cedar Fire in 2003; Witch Fire in 2007 which induced about 500,000 people to evacuate [a fifth of San Diego County, as memory serves]), but it seems to me that Hurricane Katrina actually changed very little. The East Coast has a record of receiving, preparing for, and recovering from hurricanes. Pingback: Reality check: Who believes Hurricane Sandy is/is not caused by global warming? | Watts Up With That? I lived in the city as a young fellow, which I enjoyed very much. I always had the feeling that something exciting was about to happen…and it often did. I think my old apartment house on Commonwealth Ave was purchased by B. U. and subsequently converted to dorms. Currently living in Sharon which is between Boston and Providence off Rt. 95.. My wife and I first lived in Foxboro which is right down the road, until the Patriots decided to build their new stadium just about literally in our back yard. We had a big fight with the town because they had to change the zoning where our house was in order for the stadium to be built. Speaking of selfishness, my argument with the townspeople was that if you could honestly say you’d vote for this change even if it were in *your* back yard, then fine, go ahead. Otherwise such a vote (for the proposed zoning) was hypocritical in the extreme. Of course we got slaughtered at Town Meeting. I think my own brother voted against me, though he’s never quite admitted it. Hah!Taught me quite a bit about human nature, stuff you’d think I’d have already learned by my late 40’s. For crying out loud it was a category 1 hurricane that happened in hurricane season! Did we forget the Long Island Express? But it hit New England in October! there is nothing whatsoever remarkable about this storm! Not listening to engineers and hydrologists can get very expensive. A report released last year by the New York State Energy Research and Development Authority estimated that a flood roughly comparable to the one that hit the city Monday night would do $10 billion in damage to the transportation infrastructure and cause another $40 billion in economic losses due to the paralyzing effects of a crippled transit system. Klaus Jacob, an environmental disaster expert at Columbia University who oversaw the portion of the report dealing with transit disruptions, said the study estimated that it would take four weeks to get the subway system back to 90 percent of normal capacity. By contrast, predictability with climate models is a modern “wonder”! the best-fitting model outputs have a negative coefficient of efficiency and a correlation coefficient near zero. The results for AR4 are no better than those for TAR. In some, the annual mean temperature of the USA is overestimated by about 4–5 deg C and the annual precipitation by about 300–400 mm. As you are always harping on about uncertainty, you should have realised that these very early numbers are highly uncertain and were bound to rise. Instead of shooting from the hip, why not wait a day or two, then make a more considered judgement ? As sad as any loss of life is, the fatality and material loss numbers are, indeed, “surprisingly low” for a storm of this size hitting an area with this population density and size. In a few days, a bit more will be known, but it is highly unlikely that the casualty or loss numbers will grow by an order of magnitude. Heat is accumulating in the world’s oceans (http://imageshack.us/photo/my-images/267/ohc02000pentadalnodcnos.jpg/), UNABATED, due to increasing levels of greenhouse gases. That accumulation will be felt. The victory in the climate wars is increasingly being decided by mother nature herself. Who shut off the T-to-the-4th power IR radiation? Funny of you to use the word “victory”. If the denialists (and yes, they do exist) are correct, and there is no AGW at all, then years of valuable human effort and research dollars have been wasted when they could have been spent on more or urgent needs. If the skeptics are correct then science has suffered at the hands of a consensus-seeking monster (IPCC) run amok. If the luke-warmers are correct, then time has been wasted in arguing over an issue that won’t have much of an overall effect. If the warmists (i.e. people like me) are correct then we’re screwed because we’ve wasted time arguing or headed toward nonproductive policies when we should be figuring out how to harden our food and water supplies and prepare our cities and infrastructure for climate change regardless of the cause. If the catastrophists are correct then we’re all pretty screwed anyway as “something wicked this way comes”. As a warmist, I do agree that energy is accumulating in the world’s ocean and I do think that ultimately the proof of AGW (for the masses) will be in the actual weather as experienced. Nature will provide her own proof. But for the above stated reasons, there is little reason to think that any outcome will result in a “victory” for anyone, and any perceived victory will be a pyrrhic one for certain. What you talk’n’bout Gatsey! You can’t even prove how GHGs cook the oceans. Why that “accumulatin'” energy coulda/musta been in them there oceans the whole durn time. Long before you warmistas started abusing the Mpurical data from those neat little ARGO robots. No need to worry, natural variation is gonna exchange just enough stored frigid to keep the surface air temperature in a prolonged decline so them whiney little CAGW’ers look like the liberal pinko socialist fools the good book says they are. We’za coolin’, and not even kim and abner knows fir how long ‘cuz abruptful climate change ain’t not gonna happen right in the middle of yur stupid linyur global circulation models. As a card carrying member of the American pubic, I require something a little less technical. hmm well done. looks like i’ve been poe’d. Just goes to show how far they’ve gone that I assumed such a ridiculous shrill comment actually came from a skeptic. Don’t know what “good book” you are talking about…unless it would be: The Faux News Guide To A Fairly Unbalanced View Of Everything That Matters. If this increase exists it is a miniscule fraction of the ocean’s heat content and an unnoticible temperature change, hence harmless. The ocean is very cold. I’d recommend that you watch the video posted by Steve Mosher above of Jennifer Sanders. That’s Dr. Jennifer Francis, and yes worth watching. 1) are storms like this black swan events or dragon king events? 2) does this storm indicate an extreme outlier of a climate regime that is not undergoing change or what could be a new norm as the climate shifts to a new regime? 3) if a shift to new regime seems to be indicated, what is the role of natural versus anthropogenic forcing in that shift? Superstorm? More like the Fat Lady singing. Certainly not an “extreme outlier” just a big storm. The hyperboly is the extreme here. You pick David– black swan or dragon king. Just by statistics alone it is one of those. Only research will tell us which one, but the difference will make all the difference in the long run. Not really Gates. Outliers are far away from other data points, not merely at the high end, so far away that they do not fit the distribution. This is what outlier means in statistics. Show me a hurricane distribution where Sandy is an unexplainable outlier. Please do not use storm surge as I have already explained that that has as much to do with the moon and chance as with the storm. The hyperboly is the extreme here. “Hyperboly” is rapid-cut East-Indian cinema. Second: It’s the post-hoc rationalization that’s extreme here. You know, the moon’s effect is not disjoint from what you are calling “the storm”. There was no counterfactual “Sandy-without-the-effects-of-the-moon” storm, except in your head. I mean if you want to argue that Sandy would have been a regular old hurricane but for the moon and chance, why stop there? Why not argue that the sea-floor topography is to blame. Or that if the rotation of the earth were slower, the hurricane would have been less intense. Why don’t you blame the ocean for being right next to the coast? Frankenstorm Sandy does not have to be an “unexplainable” outlier, but merely an infrequent and improbable event. Nothing that happens is “unexplainable”, but simply more or less likely. 2007’s low Arctic sea ice was an improbable outlier at the time, and hence a “black swan” but as we’ve seen now, it was actually a dragon king, indicating a new Arctic sea ice regime. It is only after the fact, through observation of ensuing dynamics in a system that we can see if a black swan was either a highly improbable event, not to be repeated within a certain period, or a dragon king event, indicating a change in regime for a given system. We won’t know what Frankenstorm Sandy is until we actually see if the system is changing to a new regime. If we get a another such superstorm in the next few years and then another etc. (like the continued low sea ice records being set the Arctic) we will be able to infer that Frankenstorm Sandy was not just an improbable (but not unexplainable) black swan outlier, but indicated that a new climate regime is beginning. Heinrich, my point is that the surge is not an outlier for the storm because it is not a property of the storm per se. It has an additional coincidental cause. This is a basic statistical point because Gates is making an incorrect statistical claim. Gates, neither black swan nor dragon king are statistical concepts, rather they are vague metaphors, so I do not use them. You claimed Sandy was an extreme outlier, which is a statistical claim, which I am challenging. Show me the distribution where Sandy is an extreme outlier. Sandy was well predicted in terms of track and intensity. An equivalent of cat 3 storm surge was predicted, owing to the large size. The only record set by Sandy was record horizontal extent (note: Ike also had very large horizontal extent, and large storm surge when it hit Galveston). So I don’t see how this is either a black swan or dragon king. Heinrich, my point is that the surge is not an outlier for the storm because it is not a property of the storm per se. My point is that yours is a very stupid and rather straw-grasping way to divide up the world into “properties”. If the surge was not a “property of the storm” then neither was the rain and the wind. Defining black swans as Taleb does Sandy was clearly a black swan. No other single feature of the storm needs to be exceptional to make it a black swan when the damage caused by the storm is exceptional. That’s enough and enough with a wide margin in case of Sandy. black swan’s imply something that was unforeseen. Damage is not exceptional; right now we are looking at something that might rank around #15 in terms of U.S. hurricane damage. From the Wikipedia: The black swan theory or theory of black swan events is a metaphor that describes an event that is a surprise (to the observer), has a major effect, and after the fact is often inappropriately rationalized with the benefit of hindsight. Seems like only the ‘has a major effect’ was met by Sandy. True, blacks swans are more a product of ignorance :) There have always been tides and hurricanes. Nassim Taleb’s black swans are not predictable, they are rare and they are in some way of exceptional importance. Not predictable means does not refer to the short term predictability but it’s enough that Sandy was not predictable one year ago. Of course all this argumentation is semantics. Therefore I didn’t make any more general statement that to say that Sandy was a black swan as defined and described by Nassim Taleb. He did consider also rare market crashes black swans. They share all these features with sandy. Damage is not a property of the storm in the same way as mmHg, windspeed, and diameter are. It’s a property of the substrate, and Pekka is bright enough to understand this, but may have nothing else to cling to in the wind. You forgot to mention barometric pressure, kim. A highly predicable event, I might add. oops. Guess I should have looked up mmHg. Apologies. how does Sandy compare to the half dozen big historic storms of the previous 100 years? The black swan is a hurricane hitting Ne Jersey a little South of New at high tide and with all other aggravating factors that made the damage exceptional. A storm of the strength of Sandy is not a black swan but all put together is. This is exactly similar to many if not most examples of Taleb. Linguistic errors in my above message are just errors, not a black swan. Hang on, Sloopy, to what you got. By what criteria? By location, size, and general calendar date it would seem to be a black swan event at the very least (i.e. as improbable but obviously not impossible) occurance under the current climate regime. When was the last time a storm hit NY city with such intensity so as to flood the subway? As such, just like a large stock market crash, it can happen, though it is rare. It is here that the distinction between the black swan and dragon king can be most useful. If this “once in a generation” type of storm begins to hit once every 5 or 10 years, we might suspect a change of regime is occurring or has occurred. Unfortunately, we can’t really identify dragon kings until after they’ve passed. Heinrich, the surge is not the height of the water. It is the difference between the height of the water and what it would have been without the storm. I cannot say it any simpler. Which was pulled from this artcile that Judith posted quite some time ago. Where we can see the relative distinction between black swans and dragon kings, and the ability to “foresee” seems to have very little to do with the overall definitions, but rather it is a ratio of heterogenity and interaction strength. At any rate, I’ll have to ponder Judith’s element of the “unforeseen” in black swan events, as it would mean the definition is relative to human technology, rather than expressing some abolute quality of the dynamics inherent in a system such as described in the article above. We see that the last time that we had two years in a row that some hurricane or tropical storm hit the NY area was 1954. Interestingly, this was also during a cool phase of the PDO, which could give some ammo to Judith’s push for funding of a grant to study such things. So, with the average length of time between such storms hitting the NY City area being somewhere around 8 to 10 years going back to the 19th century, suppose we get another storm like this next year, or the year after? 3 or 4 of these occuring in a 5 year period is very improbable, and while statistically unlikely, of course not impossible, and are (at this point) unforeseen. But what if we see the frequency of these increase, just like the frequency of years with lower than average Arctic sea ice has increased over the past few decades? At what point does a trend indicate a regime change? A black swan is supposed to be a major event not predicable before hand but predictable in retrospect. It is like Taleb has a sarcastic sense of humor. Remember, he is not a very big fan of models. I always cringe at this sort of sentence. There is little to no disagreement that there are natural variations in climate. But then, you tag on, “anthropogenic forcing”, as if the certainty of CAGW is as great as the certainty of natural variations. It is not. There is general agreement that AGW exists, but the magnitude of the effect is not certain. There is absolutley no proof in physics that CAGW is any more than an extremely plausible hypothesis. Why did you bring in the term “CAGW”? Looking for the anthropogenic forcing component in climate change has absolutely nothing at all to do with Catastrophic Anthropogenic Global Warming. You introduce this red herring argument as a way to muddy the waters or what? Yes, anthropogenic warming exists, yes increased greenhouse gases are causing an alteration in the TOA energy flux, so it makes sense to want to know what the anthropogenic component of climate change acutually is since climate change is all about alterations in Earth’s energy balance. I connot have explained myself very well. We know that natural variations are huge, and have a major impact on climate. The question is how large are anthropogenic effects? If these are negligible in comparison with natural effects, then it is highly misleading to put them in the same sentence, as if they have equal weight. So, my difficulty is how to describe the difference between natural forcings, which are huge, and the effects of AGW which I am certain are so small that we will never be able to measure them. That is why I introduced the term CAGW; to try an emphasise that there is this huge difference between natural effects, and anthropogenic effects. AGW, by itself, will never cause a shift to a new regime. CAGW might, if CAGW is real. They logically belong in the same sentence because the scientific question is to see the relative strength of the two. It is not misleading at all as the question at hand is: what is the relative contribution of natural variability versus anthropogenic forcing over some given time period? Black Swan. Oct. 29 1693, Oct. 18 1703, Oct 8 1747, Oct 8 1782, Oct. 18 1782, Oct 9 1804 Oct 3 1805 etc. “October 29, 1693- Another tropical cyclone struck New England and caused flooding so great that new permanent inlets were created.” Wikipedia. I would suggest that any attempt to define how such storms should be looked at needs to start with elimination of all of the hype and overblown adjectives the MSM loves to attach to it. Super storm, Franken storm, monster trees, wiped out, etc, etc etc. It was a storm. You could go so far as to say it was a big storm. After that you lose any claim to scientific discussion and start moving into the realm of media shill wannabe. Just realised why I was having trouble with the whole ‘black swan’ metaphor. The damn things are everywhere here (Australia). George Dubya Bush caused this storm all by his pea pickin’ little Texas self, but all the wires lying around hot are Obama’s fault. I’m just wondering how the Frankenstorm fits into the definition of CAGW? Now, I’m not saying that the Frankenstorm is directly linked to AGW, anymore than we could say Katrina was. But, without AGW, we’d have less possibility of seeing these kind of storms and hurricanes. Judith has suggested, in her scientific papers, if not on this blog, that these events will increase in frequency as GH gases accumulate in the atmosphere. So, if she’s right, is this CAGW? It’s not for me, but it probably is for those, and the families of those, who have lost their lives. Hmmm, more energy in the system suggests more turmoil, so what about the declining Accumulated Cyclone Energy? Maybe there isn’t more energy in the system. Like Trenberth suggested on NPR, maybe it’s been radiated into space. Also, how about the idea that a warmer Earth would have less temperature differential between the Equator and the poles, and thus less turmoil, fewer or weaker cyclones? I don’t think we know very much about this subsection of the climate we also don’t know very much about. Bad data begets bad science. Just because we are naming more storms by using satellites does not mean we are having more storms. Nor do we know the diameter of pre-sat storms, especially those that never made landfall. For that matter hurricanes do not have a diameter. There is a lot of noise in these scientific signals. Generally, yes. But cyclones are just one way the system works to equalize the energy and get it from equator to the poles and ultimately (for some of it) out to space. The MJO transports a great deal of energy from the tropics toward the poles and also from the troposphere into the stratosphere and mesosphere. There is also some connection here with sudden stratospheric warming events that occur in the polar winter which transport tremendous amounts of energy out of the system. The lesson here is that the system must be in a state that favors the formation of cyclones, but that doesn’t mean that the system is not “in turmoil” in the sense of trying to transport energy via atmosphere and oceans toward the poles and ultimately much of it out to space, though some is certainly going into the reduction of Arctic sea ice, melting permafrost, raising temperatures of the Arctic ocean etc. I take Trenberth’s estimate of this with a grain of salt. What’s your point Edim? Cyclones are one way the planet works to maintain thermal equilibrium. We know that measured TOA imbalance is somewhere between 0.8 and 1.0 w/m2 because of increasing greenhouse gases. Much of that is going into the oceans, but the imbalance may cause alterations in the dynamics of how the energy system attempts to keep equilibrium. Cyclonic behavior, MJO behavior. Sudden Stratospheric warming events, oceanic and atmospheric Rossby waves, ocean cycles, THC, etc. are elements of the energy system of the planet and might be subject to change in response to the external forcing from increased greenhouse gases. It makes sense to study all of these, and indeed, that’s exactly what hundreds of scientists are doing every day. I take everything with a grain of salt. I understand that many estimates in the official (accepted) climate science are inaccurate, some very much so. For example that “measured TOA imbalance, somewhere between 0.8 and 1.0 w/m2 because of increasing greenhouse gases” mentioned by R. Gates is very questionable. An excellent attempt as well. Would be nice to see others follow up on this. Ultimately getting a handle on exactly how much total energy in Joules is being dissipated poleward and into the stratosphere from hurricanes would be a very valuable metric to have. One of the side projects I’ve been working on is trying to estimate how much energy is lost to the mesosphere and ultimately to space during winter sudden stratospheric warming events. These SSW events move tremendous energy poleward and into the stratosphere that originate in the tropics and subtropics (much like a hurricanes). I would love to have even a rough estimate of how much energy was removed from the planet’s energy system during say, the large SSW events in January 2009 and January 2012. Dr. Karen Smith has made some rough calculations on energy flux during an Antarctic SSW in 2002, (see http://www.columbia.edu/~lmp/paps/previdi+smith+polvani-JCLIM-2012-submitted.pdf) but this has not been refined. So here’s a question for anyone who cares to tackle it– approximately how much energy (in Joules) was dissipated from Earth’s energy system to space during the large SSW events of either January 2009 or January 2012? That would be a interesting topic for a guest post. Beware though that the energy transfer between “walls” is a natural variable that is not so likely enhanced by GHG’s since they are “uniformly” distributed and the wall differential is never uniformly distributed. Since 50 to 60 S is a convergence or wall choke point, minor changes can have major impacts. There can be what, up to 100 Wm-2 fluctuations at a wall involving transfer of ~15% of the global energy balance? Of the 30 worst hurricances to hit the USA, all except Katrina occurred long before AGW. Clear the superstition out of your head, tt. I do remember that Judith once corrected me when I’d written that she’d previously claimed that there was evidence of increased hurricane frequency in recent decades. She said she hadn’t found that but there was evidence of increased hurricane intensity . Ok. So, let me get it right. It’s intensity not frequency. I’m not arguing with that. Seems to me that an increase in intensity will mean more storms reach higher categories. I don’t see how intensity can be decoupled from frequency at a theoretical level. On a measurable time-scale, a fractional increase in intensity may not bump a significant number of storms up in level – but over the long term more intensity would translate into more frequent high category storms. I think that must be right. If a category 4 hurricane becomes a category 5 hurricane, then there must be an increased frequency of category 5 hurricanes. And presumably some tropical storms would be ‘promoted’ to hurricane status? Maybe Dr Curry will tell us more? I assume it isn’t matter of global warming but how the North Atlantic accumulated cyclone energy (ACE) is dissipated during the hurricane season. Current total ACE number is 121 (just above normal) of which Sandy 12.5 (Nadine =25), from which one could conclude that global warming may not be the main contributing factor. “It’s like what happened at the Fukushima nuclear complex in Japan last year — without the radiation. At a Consolidated Edison substation in Manhattan’s East Village, a gigantic wall of water defied elaborate planning and expectations, swamped underground electrical equipment, and left about 250,000 lower Manhattan customers without power. With all the planning, and all the predictions, planning big was not big enough. Superstorm Sandy went bigger — a surge of 14 feet. So it failed due to 1.5 feet more surge than designed for. Lets hope in context of this figure that future designers take into account sea level rise! Seriously this was high tide which only happens twice a day during a near full moon which only happens roughly once a month and a fall full moon at that, which gives a high tide only second to a spring full moon. So a lot of the surge height was due to factors other than the storm, meaning the same storm could have had a significantly smaller surge. How much is an interesting question? Your statement seems insufficiently quantified. A fractional increase due to sea level rise can have a disproportionate amount if impact. I.e., it can make the difference w/r/t over-topping seawalls, flooding subways, etc. Until global sea level rise approaches the magnitude of variability from lunar tides, it is small factor in storm surge risk. Human’s can rank risk factors in order of size as though they are logically disjoint – But the relevant fact in the real world is that these effects are additive – and sometimes disastrously so. Like Fukushima, without the thousands of deaths, is a better description. Not to belittle the damage caused and the lives lost, but there is no real comparison between the two. Nobody predicted? That can’t be true. I heard Curry and Webster’s on the job for them energy companies. “Future designers” should take sea level rise into account, by all means, as they have for centuries in the Netherlands. Bring over some Dutch engineers. The Dutch will have their little thumbs too busy with their little dikes to be bothered with anybody else’s. I’m talking about the future. This thing is barely getting started. Well the Dutch would actually love to come over and help. Seem to think that they’re the only ones who know how to build a dike. The real issue is political: are you going to spend the money needed for protection. They are not the only people who know how to build a dike. They built dikes in a specific situation, with a rate of sea level rise that allowed them to do it. If the leading SLR scientists are right, the globe will be dealing multiple meters by 2150, and the Netherlands with be dealing with the Mitrovica types. And according to them it appears the Netherlands will be little affected, so I am wrong and the little Dutch boys will be available to plug their thumbs into failing dikes all over the world. The problem is if politicians deny AGW and won’t allow Dutch engineers to propose or design the defenses necessary to cope with sea level rises caused by AGW. That of course would lead to CAGW! If we add the local sea level rise since 1821 to the 11 foot surge in 1821 what surge do we get? Funny if they missed that step. Some of the east coast has sunk quite a bit tectonically but I do not know what NYC’s stats are. The Houston Medical Center planned for flooding events after the 1976 flood. They under engineered the solution by not taking into account subsidence. When Allison came through in 2001, the TMC engineers learned first hand how making accurate assumptions about elevation is really, really important. First you say “Who exactly said there was a link between this years sea ice loss and C02? Certainly not me. The science is pretty clear. There is heating in the pipeline… The frankenstorm is directly tied to global warming. There is heat in the pipe. We will see more frankenstorms that mitigation can do nothing to stop. Is there, or isn’t there a connection between CO2 and climate change? If so, what effect does increased CO2 have? What portion of added CO2 is natural vs. anthropogenic? What portion of added heat is natural vs. anthropogenic? How did ‘heat in the pipe’ influence frankenstorm Sandy? Why will ‘heat in the pipe’ produce more frankenstorms? We’ve seen the weather pattern that produced this frankenstorm before with Hurricane Hazel in 1954. Was frankenstorm Hazel also influenced by ‘heat in the pipe’? What are the differences between frankenstorm Hazel and frankenstorm Sandy? Let me point out that neither Irene nor Sandy made landfall with sustained winds (recorded on land) in excess of 64 kts / 74 mph. We’ve now gone seven years (since Katrina), without a major hurricane striking the continental US. Judith correctly points out that the data could just as well be interpreted to indicate that added CO2 and warmer temperatures produces fewer and weaker storms as opposed to more frequent and more powerful ones. Shhh, let’s not inject reason and optimism into a good opportunity to get worked up into a froth! Senator Franken is not responsible. Kudos to CFAN and its founders. Having lived through hurricanes for over 50 years now, I am amazed at how well the forecasts (well at least some of them, the American Model needs work) have gotten, and how far out they are getting. Locally, Dave Tolleris started projecting a hit along the Delmarva Peninsula, or a little north, a week out (about the 24/25th time frame). Based upon the European/Navy Model. People should start paying attention to the differences between those 2 models as the European one seems to have a pretty good record, at least as it affects us here in the Mid Atlantic. It is interesting to note that apparently there was precedence for storm surge inundating the Manhattan Island area in 1821. However, the trajectory of the 1821 was more typical, moving parallel to the Eastern seaboard and apparently moving quickly to the north. This still leaves Sandy as highly unusual in its trajectory. Flooding of the Westside Highway? Didn’t James Hansen say something about that? ho ho ho. I looked up the same thing the other day for that reason. At that time it hadn’t flooded yet. What was the context of the prediction-that it could happen in one of the most severe storms of the last century or that due to sea level rise it would be inundated permantly? The trend seems to be towards fewer storms, but smarter … they’ve hit where it hurts most. CHRIS MATTHEWS: Well Professor [Michael] Oppenheimer, back in the 60s, we calls such people pigs. Pigs. No, really. They don’t care about the planet, they don’t care about the destruction of war. All they want is what they got, their stuff, and they want more of it. Is that what we’re facing here, just greed? I’m not talking about the guy at the coal mind, that’s hard work. I’m talking about people who won’t listen to you, won’t listen to science because they want more stuff. Anyone who hasn’t yet figured out Chris Matthews has gone off the deep end probably needs to have a supervising adult making decisions for them. Mooney, just like the name, one of the warm and fuzzies with a poor model of reality. So what portion of the CO2 in the atmosphere is natural and what portion is anthropogenic? The answer is “We don’t know, and we don’t even have a reasonable estimate.” Any estimate could be off by orders of magnitude. we do have a reasonable estimate. I can tell you right now that aint caused by volcanoes. Wow. You must be sincere. That graph is very misleading. Splicing the very questionable CO2 ice core data with the continuous measurements (at ML? ), which began only ~50 years ago, is deceptive! 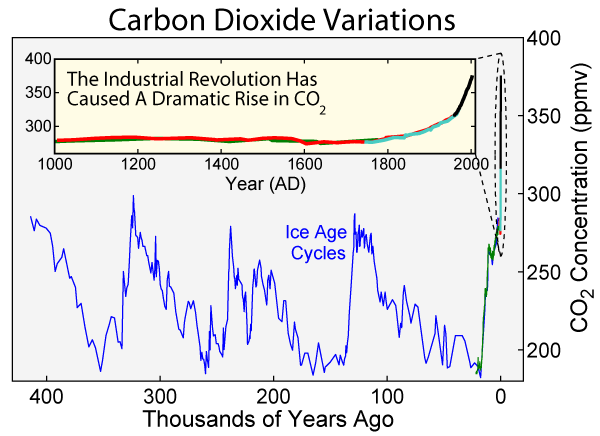 That CO2 hockey stick (since ~1000 AD) is even worse than the temperature hockey stick – it’s based on nothing sensible. There are a lot of older direct measurements, some very accurate, and even if they’re not background concentrations, they can be analyzed and studied (compare to modern non-background values, try to pick out the background concentrations…). You lie that the ice core data is “very questionable”. Question: why do you deceive? You may agree with that because you probably wish to agree with that. You might choose a more critical approach and check the sources of your reference. Then you would find out that the main source is not a specialist of ice core research but a medical doctor and specialist of radiation protection turned a climate skeptic and very outspoken as that. While the paper you refer to tries to give the impression of impartiality that’s very clearly a fake. Some of the discussion that follows the text shows that clearly as well. There’s no doubt that determination of past CO2 concentrations is plagued by difficulties but your reference has zero value in finding out the level of present understanding in that area. Pekka, that doesn’t impress me much. I repeat, there are a lot of accurate direct measurements/data and even if non-background, they can still be compared to modern non-background concentrations. There are also accompanying wind speed and other meteorological measurements (temperature, insolation…) and sometimes the time-series show clear diurnal and even parts of the inter-annual cycles. From what I’ve seen, many are actually not lower than modern concentrations. Professional scientists should study this and not hand-wave and suppress any discussion or research (meta-analysis for example). What makes you think that the scientists have not studied all the important questions? I don’t know much about the field but I know what scientists do in general. Based on that I would be really surprised to learn that they have not spent a lot of effort to study exactly these issues. Having an obviously partisan report to claim otherwise tells absolutely nothing on the issue. CO2, like steam, is invisible. Maybe there’s an undetected high pressure leak. Nice. More food for thought.. The Ents, they gotta coal mind. “Once again you provide ZERO support for your claims and position. And refuse to look at any data which does not support your undocumented claims. Once again – I do not care what the storm was called … it was for a FACT, beyond a shadow of a doubt, an extremely dangerous storm. At last count 50 U.S. deaths and damages of $50 billion, both still climbing – and folks like you still ridiculing the strength of the storm. Pay attention; no one’s is ridiculing its strength. Behold, it was strong. We’re questioning its relationship to anthropogenic CO2. Louise: folks like you still ridiculing the strength of the storm. Who ridiculed the strength of the storm? Louise, I came across this, among much else: He explains the difference between sustained wind speed and gust speed. He gives you the all important sustained wind speed readings. Sandy was a tropical storm not a hurricane. That does not “ridicule” the storm. It possibly ridicules the AGW hype over the storm. I just do not see the major storm that has been hyped for two days. Joshua, yep I missed those. You are, of course, absolutely correct. But the question is, why was it so dangerous? It was not just the strength of the hurricane; Sandy was not that powerful a hurricane. It was the combination of the Arctic front sitting just in the right (wrong) position, and a low pressure are just getting ready to form a Nor-easter. It was this combination of factors that led to the severe damage, not just the strength and size of Sandy. Note, some of the chaos was caused by a snow storm in West Virginia. One does not really associate snow with hurricanes, but you certainly do associate snow with the Arctic front. Jim Cripwell – I didn’t write those words, that’s why I put them in quote marks and gave a link to where they can be found. I even named their author (A. Scott). Given Ryan Maue’s graph of the recent decline of Accumulated Cyclone Energy, I’ve repeatedly asked Chris Mooney when he is going to write ‘Calm World’. Crickets chirping on a sultry summer evening. Sorry, Louise, Chris Mooney has nothing to say to me. I’ll take that as a “no” then. You couldn’t spend 22 seconds of your life to see what I posted but you thought it worthy of two replies to me. OK – now I understand your approach to debate I’ll just scroll on by. My two correspondences are reports from Chris Mooney’s ‘War on Science’. Sorry, you were collateral. What would you do about that incredibly alarming scenario? A) Move New York 100 miles inland. B) Install billions of dollars worth of wind turbines and solar cell which are miraculously immune to wind and water damage. C) Grab a mop and bucket. That (D) may be very a good suggestion. The question is why the state of New York did not do what you suggested. Nuclear power is harder, so a good idea. There is no guarantee with flood defenses. It is better to either design hard structures so you can get up and running faster or do a Bangladesh and don’t build valuable structures where they can be damaged. The last two are grab a mop and bucket, there is no way to plan for everything, but you can plan on how to recover from nearly anything. You didn’t tell that the clip is from July 2007, not something recorded after Sandy. I watched and did not find anything interesting in the video. In your opinion is it a federal issue or much more of a state issue? I’m UK based and so we’re also getting reports of damage caused outside USA (e.g.Haiti) where there are whole regions devastated in societies that do not have the ability to rebuild as the USA has. Haiti is now getting hit by hurricanes? Stop the presses! Now that is a new development and must tip the balance towards accepting the most rabid AGW claims…..
Louise, you should stop when you are not so far behind. “I see no evidence that mitigation actions will have any measureable impact on lessening bad weather within any timeframe important to those paying the expense” – Rob. Exactly the kind of short-sightedness that we need to overcome. “There are often claims that anthropogenic global warming will lead to increased frequency and intensity of damaging cyclones. Leading US climate scientist Judith Curry is an expert on tropical cyclones. Her company produced accurate forecasts of Hurricane Sandy, and briefed over 400 energy sector personnel planning to deal with its impacts. “While the US presidential candidates have halted their campaigning in order to deal with Hurricane Sandy, it might give them pause for thought on anthropogenic climate change – a subject that has been conspicuously absent from their campaigning. “More violent hurricanes are one of the scientific predictions as a result of global warming. The Arctic ice-melt and warmer oceans are reasons why Sandy was so destructive. Both of these factors appear to be a result of human greenhouse gas emissions and while some nations, especially the US, argue that measures to combat warming are too costly, the costs of not taking action are much higher. The estimated cost of Sandy is about $US50 billion. Add the crop failures across the US this year, then the consequences become more apparent. The Arctic ice-melt and warmer oceans are reasons why Sandy was so destructive. Both of these factors appear to be a result of human greenhouse gas emissions. Arctic ice-melt and warmer oceans are well inside the bounds of the past ten thousand years. No actual data says otherwise, only alarmist opinion. John Chapman is wrong on both the science of cyclones and costs and benefits of emissions reductions (“Sandy’s warning,” Letters, 1/11). There is no evidence to suggest global warming will be accompanied by more or more intense cyclones. Leading US climate scientist Judith Curry is an expert in this field – indeed, US energy companies relied on briefings from her company in preparing for Hurricane Sandy. Curry says that the only possible impact of global warming on Atlantic hurricanes is the extension of the tropical Atlantic warm pool eastward (towards Africa), so that formation is occurring further east, with more cyclones curving North into the Atlantic rather than threatening landfall. On intensity, she says that it is impossible to distinguish an AGW signal from natural variability. In short, alarmist claims have no basis in fact. A Stanford University forum brought together 21 models estimating the costs of emissions reductions sought by the IPCC. On average they estimated costs of 7% of annual global GDP by 2100 – many trillions of dollars. Compared to this, the cost of Hurricane Sandy is very modest – about 0.3% of 2012 US GDP. Many studies, e.g. Peter Lilley’s recent critique of the Stern Review in The Australian, have shown that the costs of emissions reduction programs far exceed any potential benefits. Good call so far. I’m keeping score. Herman, The Australian ran my letter today (2 Nov in Oz), along with letters from Bob Carter and William Kininmonth. You state that “The only possible impact of global warming that I am seeing on the Atlantic hurricanes is the extension of the tropical Atlantic warm pool eastward (towards Africa), which means formation is occurring further east than previously and results in more TCs curving North into the Atlantic (so called fish storms)”. Could you point me to a reference(s) that would allow me some further in-site in this matter. As a government geologist it is quite relevant to my work in assessing coastal hazards. Is the Western Tropical Warming Pool expanding in width, depth, or both? Does the increased water cycle of the Western Warming Pool serve as a brake on the impacts of weather in the Mid-Latitudes? As usual those forecasts live or die based on how much rain falls, but some of their more experimental products got the overall area right, straight west to Ohio. Figure: Last 4-decades of Global and Northern Hemisphere Accumulated Cyclone Energy: 24 month running sums. Dr. Curry: In the run-up to Sandy’s landfall, much was made of the intensifying effects of the massive cold front impacting upon / merging with the hurricane. There is some discussion above (RiHo08, Max, Jim D). This is why I wouldn’t even begin to post on most other discussions of the climate. Far too much trusting of estimates, not enough science and doubt.